What is God's Real Name? What is God's "Real" Name? "How do you really know God's Name means "I Will Be" instead of "I Am"? I've never heard this before." The simple answer is: This is a fact of the Hebrew language. Ex 3:12 And God said, "I will be with you. And this will be the sign to you that it is I who have sent you: When you have brought the people out of Egypt, you will worship God on this mountain." Ex 3:13 Moses said to God, "Suppose I go to the Israelites and say to them, `The God of your fathers has sent me to you,' and they ask me, `What is his name?' Then what shall I tell them?" Ex 3:14 God said to Moses, "I AM WHO I AM. This is what you are to say to the Israelites: `I AM has sent me to you.'" Ex 3:15 God also said to Moses, "Say to the Israelites, `The LORD, the God of your fathers-- the God of Abraham, the God of Isaac and the God of Jacob-- has sent me to you.' This is my name forever, the name by which I am to be remembered from generation to generation. Let's look at the page above, starting at white #1. This is Ex 3:12. We see the Hebrew , which, from right to left is A (Aleph), H (Hey), Y (Yod) H (Hey). And, right below it, we see that the NIV has correctly translated this as "I Will Be." This word "Ahyh" appears at many times in the Bible. See Gen 26:3, Gen 31:3 and Joshua 1:5, just to mention a few. Each time "Ahyh" appears in the entire Bible, the NIV translates it as "I will be", except in Ex 3:14 (white #2 above), where the same Hebrew is translated "I am." This is quite interesting. It shows that the bias of the translators prevents them from doing a 100% correct job. However, they are not deceptive people, so they feel constrained by honesty to put a tiny side-note in at white #6: "Or, I will be what I will be." So, that's the fact. The Hebrew , Ahyh, means "I will be." It is the 1st person infinitive of the verb To Be. It is translated everywhere in the Bible by the NIV translators as "I will be", except for Exodus 3:14, where the correct translation "I will be" is relegated to a side-note. So, the intelligent person should ask, what really is the problem? What about "I Will Be" makes people nervous? I'd like to point-out a couple more things before we leave this Interlinear page. 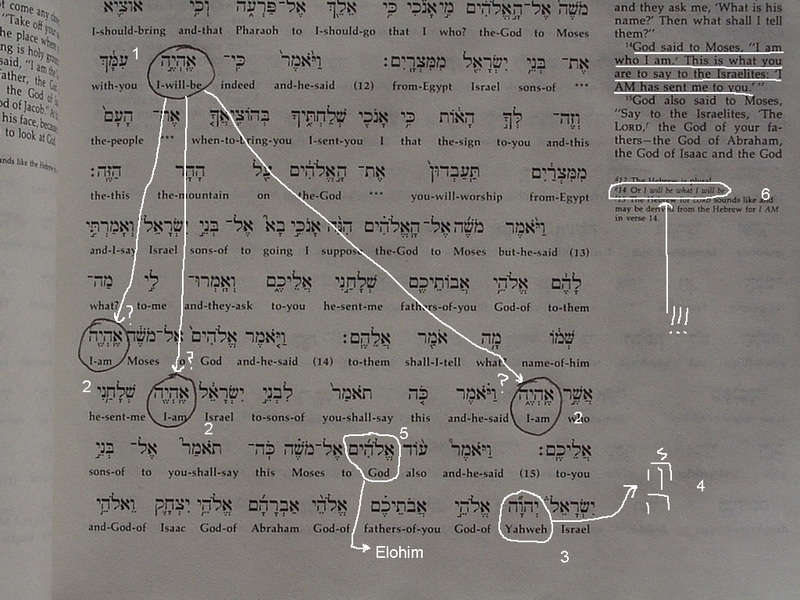 At White #5 we see "Elohim", Hebrew for the word "God." White #3: We see the Tetragrammaton, the "4-Letter Name", Yahweh, which is used throughout the Bible as God's Personal Name. "I Will Be" is only used in Ex 3:14. After that, , YHWH, is consistently used. On the side, at White #4, I have spelled YHWH vertically, so you can check & make sure I'm not making it up. Here, though, is another oddity. Though the Interlinear Bible correctly translates YHWH as "Yahweh", the regular NIV Bible translates it as "LORD." Ugggggghhhh! So, you see, the layers of (I don't want to use the word "deception", but what else can I say?) obscurity just compound one upon the other. THAT'S why The Church of Yahweh is here! No one who is alive today, to my knowledge, walked or talked with Moses. So we have 3,000 years (at least!) of history and people and language to overcome...I mean, how well do you relate to Shakespeare? And that was only a few hundred years ago! Then there's a massive mountain of prejudice..."I Will Be" reminds people of painful heresies, which they rightly seek to fight. So, we interpret TODAY these ancient scribbles according to WHAT WE WANT THEM TO SAY. Of that, friends, there is no doubt. So, never let your life, faith, or religious enlightenment relay upon the proper translation or conjugation of an ancient Hebrew root...There's a lot more to it, and Him, then that. (c) 1996-2011 The Church of Yahweh. All rights reserved. May be freely distributed, but never sold. If you are going to use this material in your web page or ministry, wonderful. But please have the honor to attribute where you got it from. Thank you.